Henry Bundles, Jr.’s biography, as written by daughter A’Lelia Bundles, is below. Her personal tribute to her father can be found on her blog here. Henry Bundles, Jr., Henry or “Mr. B”, died on March 26 after several months of navigating Lewy body dementia. At 92 years old, he remained optimistic until the end, sure that he was going to get better. Henry was born on February 15, 1927 in Indianapolis, the seventh of Mary Ellis Davis and S. Henry Bundles, Sr.’s nine children. He graduated from Crispus Attucks High School in 1943 when he was 16 years old. A 1948 graduate of Indiana University, he is believed to be the first black student to earn a degree from IU’s School of Journalism. It was a sign of the times that despite this degree and his experience as a photographer and reporter during his stint in the Navy during World War II no Indianapolis daily newspapers would hire him in an editorial position because he was Black. Undeterred, he became a circulation manager and learned the business side of journalism while mentoring and managing the young Attucks students who delivered papers. He married A’Lelia Mae Perry Bundles in June 1950. A few years later, he became sales and advertising manager for the Madam C. J. Walker Manufacturing Company, the firm founded by her great-grandmother. He was so successful at sales and business development that he was hired as president and CEO of Summit Laboratories, an international hair care company that he led to regular rankings on the Black Enterprise 100. Henry Bundles was a long-time community leader who broke barriers on many boards and organizations as a director of the Indianapolis Convention and Visitors Association and of the Indianapolis 500 Festival. He was a founding director of Midwest National Bank and advocated for minority businesses as chairman of the Indianapolis Business Development Foundation. 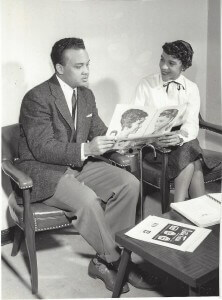 Henry was a co-founder of IU’s Neal-Marshall Alumni Club created to increase African American alumni participation and remained devoted to his alma mater. After A’Lelia Mae Perry Bundles died in 1976, Henry helped launch Center for Leadership Development (CLD), an organization designed to prepare youth of color to become professional, business and community leaders. When he retired in 2000, he and his team had mentored more than 5,000 Central Indiana students including more than 80% who went on to college. When he was honored at CLD’s fortieth anniversary celebration in 2017, the organization had grown to serve more than 2,000 students each year. It is a testament to the institution he helped build that CLD recently awarded more than $5 million in scholarships at its 2019 annual Minority Achievers Awards and Scholarship Gala. Henry’s wife, Helen Baker Bundles, who also was his professional partner at CLD, shared how delighted they were to see an alumnus while they were on vacation in Mexico several years ago. Daughter A’Lelia is no longer surprised when people learn her last name and tell her about the impact Henry and his work at CLD had on their lives and their children’s lives. He was a life member of Kappa Alpha Psi, having joined the Alpha Chapter while a student at IU. After he and wife Helen moved to Sarasota, Florida in the early 2000’s, he became active with the local chapter and was recognized as one of the fraternity’s oldest living members. In May 2018, Henry was on the front row at IUPUI’s commencement celebrating the 70th anniversary of his graduation from Indiana University. Daughter A’Lelia Bundles served as speaker that day and shared his story. In lieu of flowers, the family has graciously requested that contributions be made in memory of S. Henry Bundles, Jr. to the Center for Leadership Development (www.cldinc.org/donate/) at 2425 Dr. Martin Luther King, Jr. Street, Indianapolis, IN 46208 or to the Neal-Marshall Cultural Center, Indiana University Foundation, PO Box 6460, Indianapolis, IN 46206-6460).